Wysyłka w ciągu 48-72 godzin, dostawa gratis! Everyone can enjoy the benefits of yoga on the mind, body, and spirit with this updated, illustrated guide from world-renowned yoga authority B.K.S Iyengar, globally respected for his holistic approach and technical accuracy. 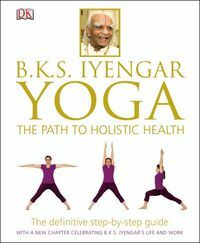 In BKS Iyengar Yoga: The Path to Holistic Health, the guru himself guides you through over 55 yoga poses, each with step-by-step instructions illustrated in full colour. Iyengar even explains his philosophy throughout the book - it's like having yoga classes with your own personal instructor. A special, 20-week beginners' yoga course makes yoga accessible for those of all ages and abilities. 20 classic Iyengar yoga poses have a unique, 360-degree presentation so that you can see the correct form from all angles. Specially developed yoga sequences help you to alleviate more than 80 ailments, ranging from asthma and arthritis to varicose veins. Whether you are new to yoga and looking for somewhere to start, or more experienced and looking to perfect your technique, this comprehensive guide will help you improve your abilities and work towards a happy and healthy life.